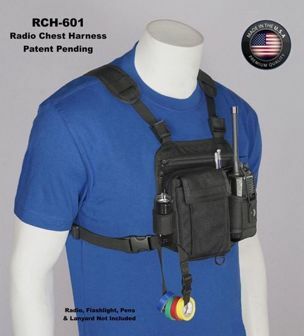 1" Flashlight Barrel 1-1/2" Flashlight Barrel AFH-04 Adjustable Flashlight Holder in use with the RCH-601 Two Way Radio Chest Harness. The AFH-04 Adjustable Flashlight Holder is a 2" x 8-3/4" strip of Nylon Webbing and Velcro that wraps and cinches in a circular shape to perfectly fit the Barrel of your Flashlight. Flashlight Head must be larger than the Barrel to keep your flashlight from slipping through the AFH-04 Flashlight Holder. The AFH-04 will work with Barrel sizes 1" Min. to 1-1/2" Max.